Here at EzyDog, we want your dog to be able to accompany you on all your adventures. To do this, your dog needs access to fresh water at all times (especially in the hot summer months in Australia) Using an ordinary water bottle is not a good solution, with a lot of water wastage and the possibility of for your dog's gums to being cut on the top of the bottle. 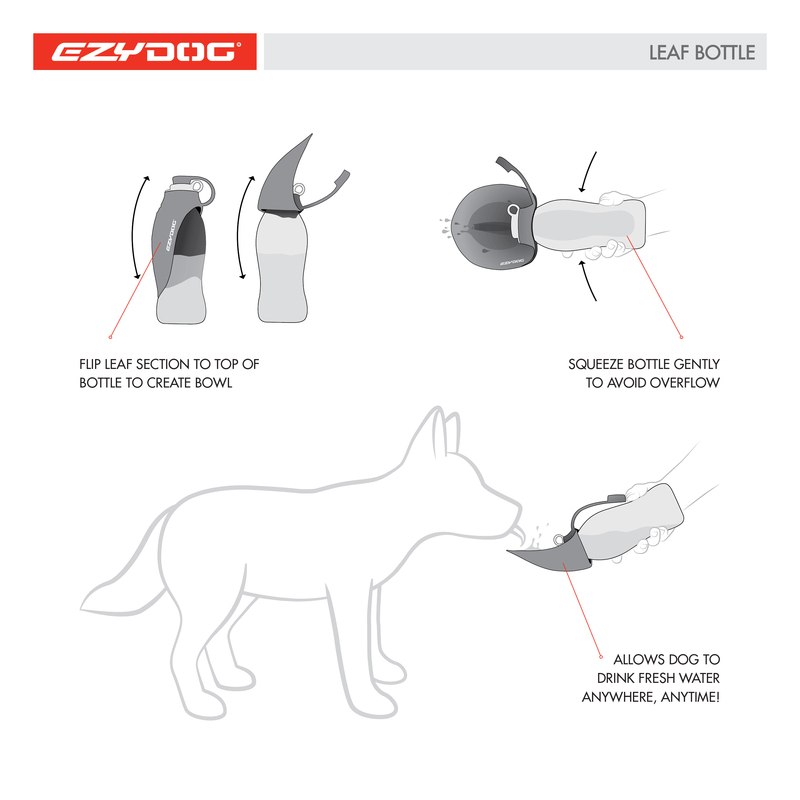 Enter the new innovation from EzyDog...The Leaf Bottle. The lid of the Leaf Dog Water Bottle is made from a flexible, food safe silicone material. This lid can then be turned inside out, creating a portable trough shape that your dog can comfortably drink from. By removing the plug and gently squeezing the bottle, water is allowed into the trough. After your dog is finished drinking, you can pour the excess back into the bottle. The silicon flap can then simply flip back around the bottle for easy transportation. Encouraging pets to drink more water is crucial to avoid heat stress and dehydration. Dog hydration products, like the EzyDog leaf bottle, help eliminate the risk of your dog being caught without access to any fresh water. "Thanks for the great water bottle, light and convenient to carry when we are out on walks. Easy to use and the new pup enjoys drinking out of the leaf cup- which is a bonus. This water bottle is better than the other one (of another brand) that we have."